Trinity - The Chip's Challenge Wiki - The Chip's Challenge Database that anyone can edit! 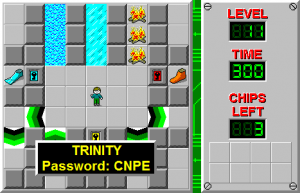 Trinity is the eleventh level in Chip's Challenge 1. 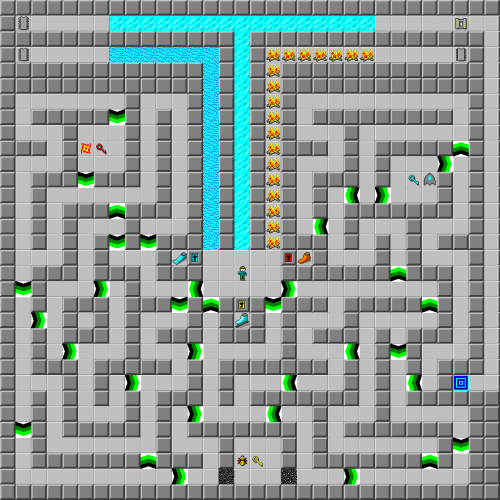 In this level, Chip must obtain the three keys to unlock the locks guarding the three boots, and then use the three boots to go through the obstacles and obtain the three chips, after which he can open the socket to reach the exit. The fastest sequence is to collect the red (no boosts can be missed), then the yellow, and on the way over to the blue key, use the yellow key to take the ice skates. This will save Chip from having to move 8 moves off track later, and use only 4 moves in the process. Take the other two boots and chips, then skate north and take the third chip to reach the exit.